If you have ever been involved in an office party where you exchange gifts, you might be lost trying to figure out what to buy! 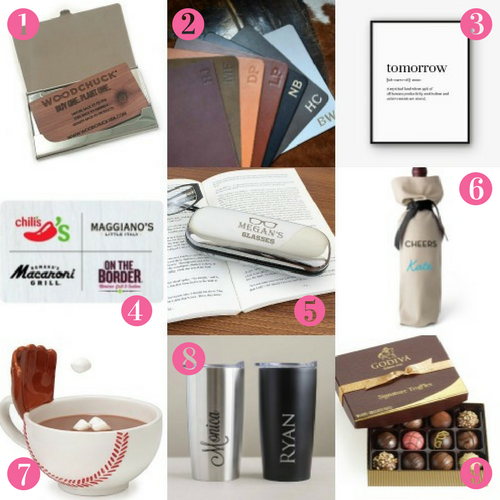 We’ve rounded up 25 co-worker gift ideas that work perfectly in an office setting. Give them a cool way to store their phones and pens during the day – while giving the phone a charge in the docking station. Stuck in an office all day can be tough for those who love the outdoors. You can find these through many retailers, including a few on Etsy. Maybe your coworker can’t get to the coffee machine as often as they’d like? A great gift idea to keep their coffee warm is a coffee mug warmer! How about a fun pair of ear buds instead of the plain old white/black ones? What a nice way to keep their workstation neat than with a cute monogrammed desk organizer? Maybe it can be a bit dark in the office? Give them the gift of light with a desk light — that will even charge a phone. Give them a way to charge their phone in a pinch with a power cell. You can get all kinds of colors and prints! A fun and easy way to spruce up any cubicle or file cabinet. Inspirational magnets are not only uplifting, but also affordable! A mini zen garden is a perfect way to chill between stressful staff meetings and conference calls. These are always great options for gifts. One company we love is Woodchuck. They plant a tree with every purchase made. You even get the coordinates as to where they planted the tree. Nothing beats giving back. What a fun way to personalize their workspace! There are many styles and options available. Let’s face it, sometimes work can be a drag. Help erase negative energy with a cool word art print! Most can be downloaded instantly and all you need to do is add a frame to finish the look. Grab a gift certificate to a nearby restaurant so they can grab lunch or their favorite cup of coffee! Watch for bonus gift card offers, where you can get a free card with your purchase. Ebay also offers gift cards at a discount. Get a case made with your co-workers’ name or monogram stitched or engraved on it. I love this gorgeous silver case from Etsy. If you find it appropriate, a bottle of wine or liquor might be the perfect gift for a co-worker. Make them a personalized wine bag to put it in as well. If your co-worker is into sports, find something fun to support his or her favorite team. One fun thing we found were these adorable mugs with nets (or a glove). Get a personalized travel mug and fill with their favorite coffees or teas. There are many styles to choose from, making this a perfect gift idea for just about anyone. Nearly everyone loves chocolate! Give them a nice little box of truffles, and they can indulge and work and not have to share them! What a fun way to stop the spread of germs at the office! I love this Tiki Tissue box holder! You have to be able to laugh at work, right? Help them with these honest acronym stickies. A No Button makes the perfect, funny little gift for the person who always has to say it…or maybe always wants to say it. These plant pens appear to be a plant — but it’s pens! I fun way to dress up your desk (and in interesting conversation piece). Find a way to break up their day with some brain teasers. These small puzzles from Amazon are affordable & fun! Find a mug that shares your real feelings about meetings, like this “I survived another meeting that should have been an e-mail” mug. This is the perfect gift for the co-worker who is always adjusting the thermostat. I love this cute Little Big Fan that runs from a USB setting. If someone is always cold, then grab them a mini heater! This tape, pen and sticky note holder is sure to crack up anyone on your list. This is desk cup holder is perfect for the co-worker who is always spilling his or her drink. What have you given to your co-workers? Anything more to add to our list?